The Gold Coast is home to an array of places to celebrate kids birthdays, but with so many options it can be overwhelming! If you’re looking for an affordable venue that’s sure to create lasting memories, then look no further than Infinity. Here are three reasons why you should book a birthday party at Infinity! Kids of all ages are enchanted, mesmerised and truly captivated by Infinity. The multi-sensory environments are full of dazzling light displays, special effect extravaganzas, mind-bending illusions, spell-binding sound fields, music exhibits and tantalising smells to invigorate all five senses. The venues offers kids an interesting and exciting experience unlike any other party venue that is both indoors and safe. To ensure everyone is having a ball, while creating those lasting memories for your children, Infinity is the perfect attraction! We understand that the expenses that come with celebrating kids birthdays can very easily pile up. After ticking off the present wishlist, the last thing you want to worry about is the cost of the venue – at Infinity, we take the stress out of that! Infinity provides the venue hire, entertainment and catering all in one and at a very competitive price. Our affordable prices mean that your kids can have the exciting, fun, memorable party they deserve, all for a price that ensures you won’t need to stress about the expenses. Our 8-guest minimum bookings ensure that you can throw the perfect party for your child for well below the average cost that most parents are paying. Our minimum of 8 guests per party ensures that all friends and family can come along to celebrate and enjoy the fun! Even better, parents of children between 4 and 13 get one FREE parent Infinity ticket. We also offer an affordable range of optional add-ons such as party bags, party hosts and digital photo packages to the event that little more special! Deciding on party food can be a tedious task to ensure everyone’s little taste buds are happy! That’s why we have partnered with Betty’s Burger’s to take the hassle out of it while providing a scrumptious, quality treat for all – so, step aside fairy bread and party pies! With our Betty’s Burgers partnership, partygoers can enjoy a delicious burger and drink package to keep them fuelled for the Infinity experience. We also have meal packages for parents to make sure everyone is having the best time! Sounds pretty great right? 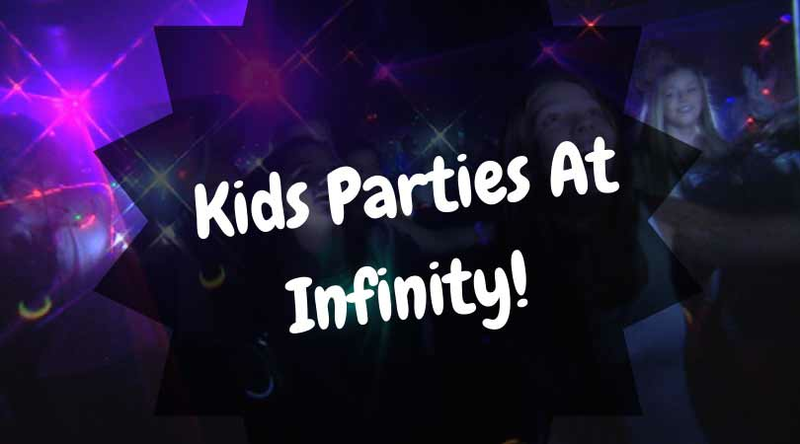 To book your kids birthday party at Infinity, just fill out the party booking form. Or, to find out more about our Betty’s Burgers catering packages and pricing via the booking form.